Hi there! Glad you came back, or perhaps it’s your first time visiting? Either way you are most welcome to the 76th version of the Airport CEO development blog and while we may be one day late, we hope that you can forgive us and stick along for the ride. If not, the reason to the delay can be found in the end of this devlog. Here’s the weekly update on the Steam Direct process: We are still on hold as of the 30 day waiting period Steam has with new developers and we are making good use of that time. The pipeline is up and running and we are at this stage pushing builds to Steam and are updating the game continuously. The store front is set up and is more or less ready for review, which we’ll do together with Steam’s review of the first game build. In conjunction with this we are also currently editing the Early Access release trailer which of course is a key element of the Steam store front and are working on other media assets that are neccesairy. While the process is straight forward, there are as you can see some hurdles we need to get over (approval by Steam) and we won’t set any exact release date until these hurdles have been overcome. We have been doing a lot of playabilitt testing this week and decided to scrap some major parts of the conveyor belt system. Don’t worry, it’s all for the better. We had some pretty compex systems in place for calculating which route a certain baggage should take, for example from a baggage bay to a baggage claim area, depending on how the conveyor belt was connected. While it worked fine, it wasn’t very fun to play around with and there were several design issues of which we hadn’t dealt with in regards to fail safes. To mitigate these issues we have now handed over the routing control to the players. The players are now responsible for connecting the various parts of the conveyor belt system. 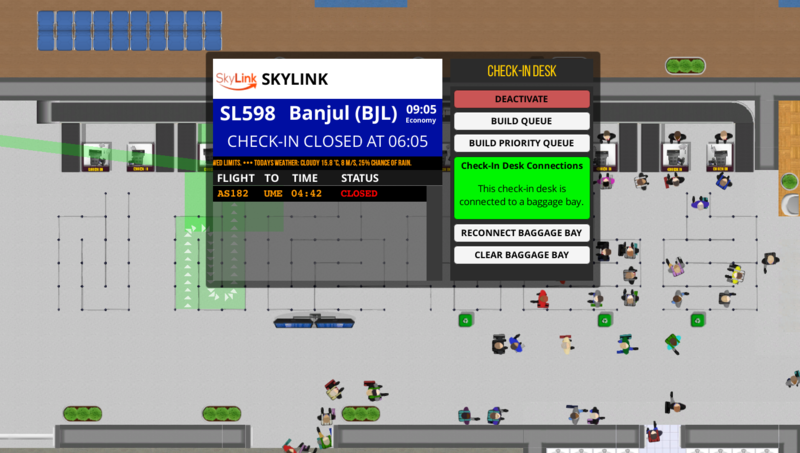 This means that in excess of constructing the conveyor belt system itself with all the neccesairy parts, the player can also directly specify which check-in desks, stands and baggage claim areas that are connected with which cargo bay. This gives the player more control and makes the systems more secure from a design perspective as baggage routes can be enforced rather than a more automated system which has to adapt to a lot of changing variables. It also decouples parts of the system and allows for a more dynamic way of handling baggage, i.e. if an aircraft can be unloaded with baggage due to connectivity issues with a cargo bay it doesn’t mean that a loading procedure won’t work if the connection between the check-in desk and the cargo bay is set up correctly. We’ll check your feedback on this and have more on the conveyor belt system next week. 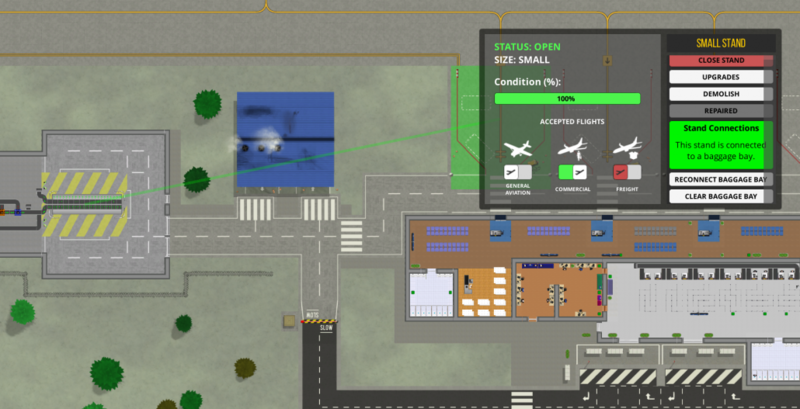 Here’s a few sample images of the current layout for our small test airport. This is of course not final UI and we will work to improve the comprehensiveness of it but it at least serves the purpose of giving an overview as to how stuff is connected. But yes, arrows and different colors will aid in further advancing that comprehension. What do you think? It was several weeks since we closed the Business Design Contest and it is long overdue that we announce the final picks. The way we’ve gone about it is through agile selection, meaning that as we’ve developed the game we’ve slowly iterated the process with implementing a few new businesses each week. We have now completed our selections and can happily announce the following winners. 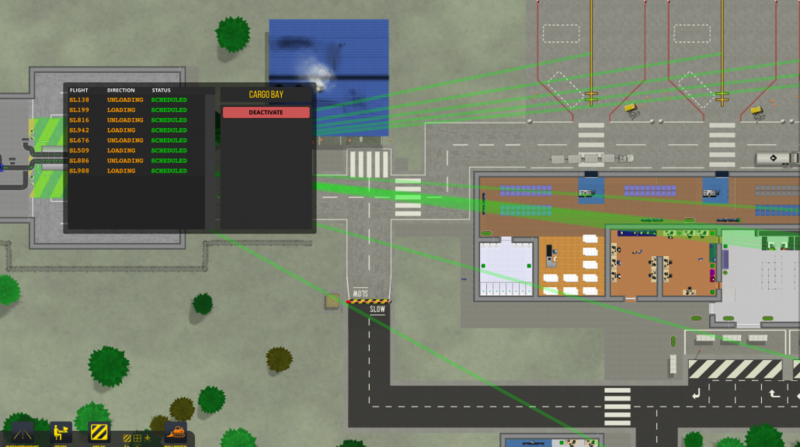 They can now call themselves game developers and will receive a free copy of Airport CEO as their work is eternalized. Such an amazing talented community that helped us out with this, allowing us to focus on the code instead of creating logos and concepts which hand’t been half as good as these. Thank you. Is your logo not there? Don’t worry, as we continue to develop we might and probably will be on boarding more (with the explicit approval of the author of course). An example of this is the fourth runner up of the airline design contest, Swiftly, which we’ve decided to implement into the game as of this week. 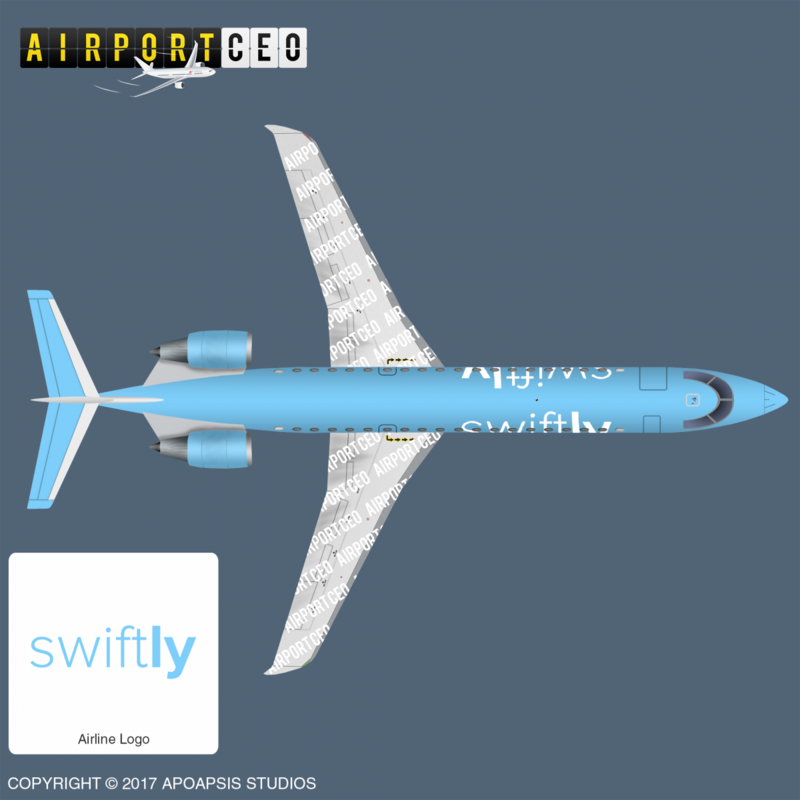 Implemented a new airline: Swiftly (fourth runner up in the Airline Design Contest)! In other news, we are currently in the process of selecting the next Airport CEO subreddit moderators. The application form closed a few weeks ago but since we’re always busy, stuff like this tends to to get put in the back seat but we believe that its really important to onboard someone else before the launch as they will then take over the operations of the subreddit and steer it forward. We had many great applications and it was extremely difficult to choose from them. However, in the end we ultimately looked at experience and interest in ACEO and chose those that best matched the profile. We will of course still be present, but the target is to remove ourselves as administrators and simply keep the dev flair so that we can keep the discussion going on reddit as well. If you haven’t checked out the Airport CEO subreddit, you do so here. The new moderators are being contacted right now and will be appointed during the week. We’d also like to announce that all Apoapsis Studios websites now connect via HTTPS to make your browsing a little more secure as well as maybe climb a little higher on the search results lists. A small change, but of course very important. Lastly we’d like to mention that last week and the coming week’s workload is, and has been, somewhat constrained as Fredrik is getting married! Possibly an even bigger project than Airport CEO and so the whole development team is involved in it (well, us two)… don’t hesitate to leave him your congratulations anywhere you’d like. Now that’s it for this week. Looking forward to the next and until then, fly safe!